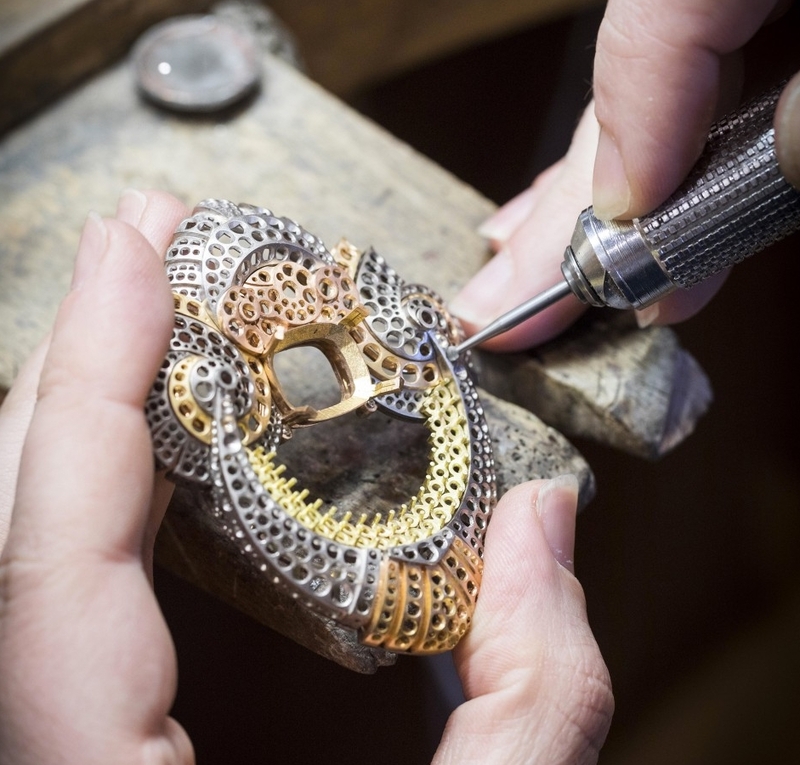 Having brought characters from the 17th-century children’s tale Peau d'âne (or Donkey skin) by Charles Perrault to glittering life in 2014, Van Cleef & Arpels is now tackling four lesser known tales by the Brothers Grimm, who popularized traditional folk tales in the 19th century including Cinderella, Sleeping Beauty and Snow White. 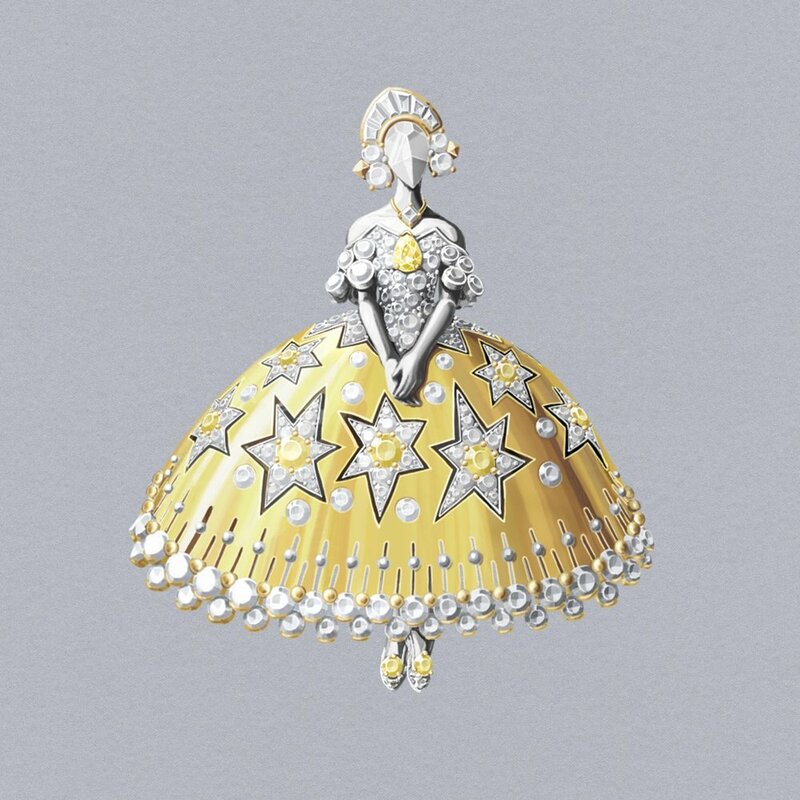 The maison’s new high jewellery collection reinterprets The Twelve Dancing Princesses, The Golden Bird, The Three Feathers, and Town Musicians of Bremen as a bejewelled world with precious stones helping to add sparkle to the main characters. 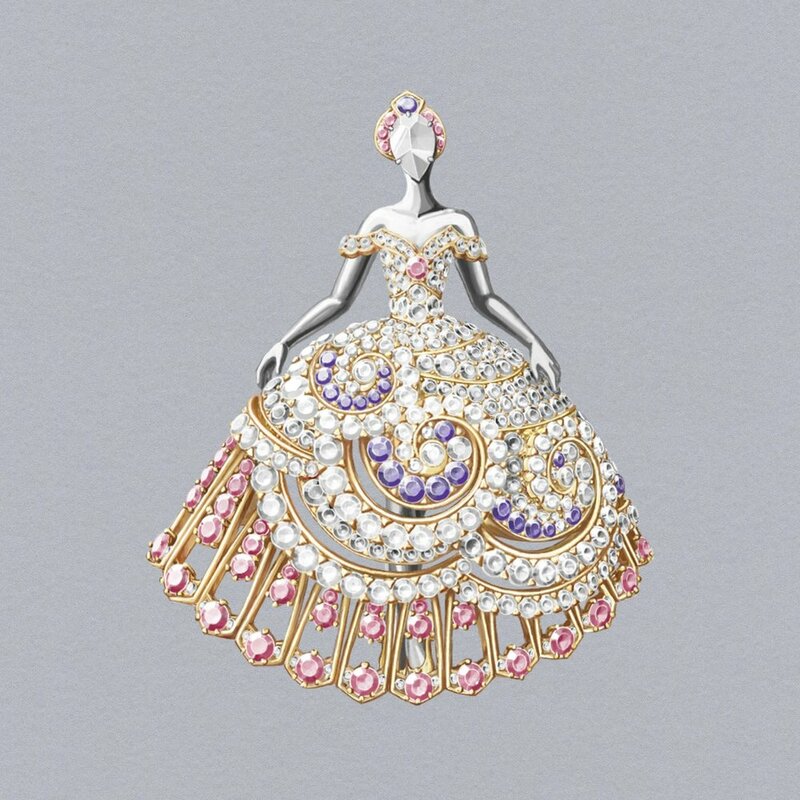 Given Van Cleef & Arpels’ close association with its ballerina clips, the tale of The Twelve Dancing Princesses is a perfect fit for the French maison which has created 12 new clips with each ballerina wearing a unique dazzling gown and adorned with a miniature diadem, a necklace or a fan. Princess Eos holds up the folds of her openwork dress with gentle tones that combine diamonds with pink and mauve sapphires, while princess Héméra, wearing a costume that layers a ‘fabric’ of blue and mauve sapphires over diamond and emerald pleats, hides behind her fan. In the fairy tale the 12 princesses dance secretly at night with their princes until an old solder discovers their secret and the house interprets key elements such as the drugged glass of wine offered by the princesses to those trying to discover their secret which is now realised as a cocktail ring with a 6.25 carat oval-cut spinel at its centre resting within a concave chalice lined with rubies and diamonds at its rim. With the story of the Golden Bird, Van Cleef enriches its animal kingdom, which already features birds of paradise and humming birds, with a yellow gold clip with feathers made of diamonds, yellow sapphires, orange garnets interspersed with sparse strokes of onyx. One of the most charming pieces in this collection is a tribute to the tale’s hero (Right) – a young prince and a rare masculine figure for Van Cleef. His knightly air is illustrated by a diamond-set plume and a polish white gold suit of armour, adorned with diamonds in hammer settings, a little-known technique that enables stones to be set directly into the metal, which thus retains a smooth surface. 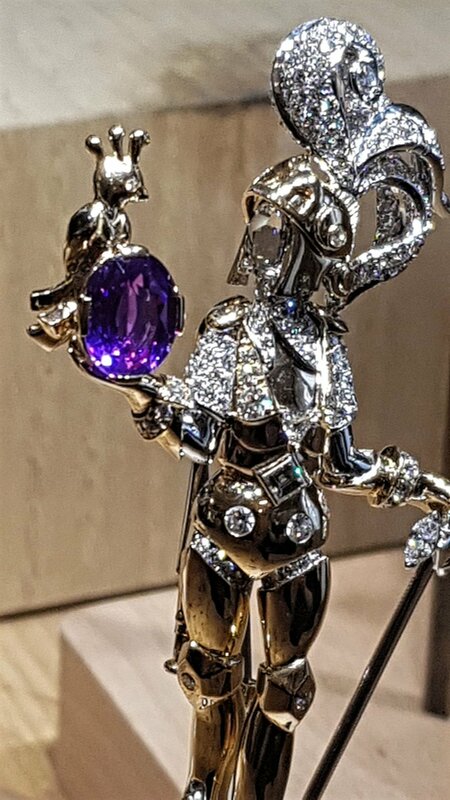 In his hand he holds a tiny golden bird perched on a purple sapphire of 3.18 carats. 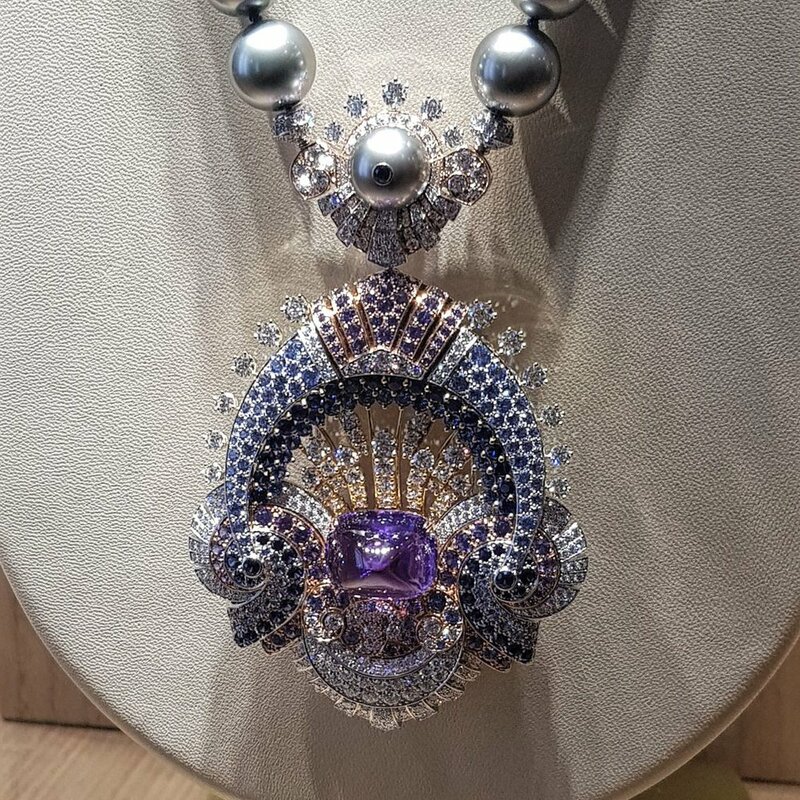 For The Three Feathers, Van Cleef used the Vitrail Mystery Set technique on sapphires for a large feather clips, whereas buff topped stones on one side and faceted ones on the other are inserted into an invisible setting, creating multiple interplays of reflection, tone and relief that highlight the translucence of the gems (technique above). Pieces from The Town Musicians of Bremen (a donkey, a dog, a cat and a cockerel) tales offers several hidden secrets (as in the previous collection), including the sculpted animals at the back of a pendant, or a different scene at the back of a large clip (on one side the animals stand in a pyramid against a deep blue nocturnal background of lapis lazuli, on the other one finds a shimmering foliage of yellow gold).